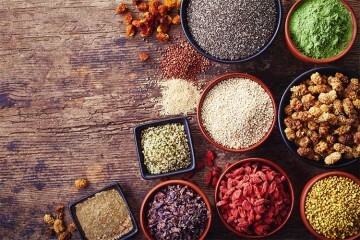 Shape Magazine recently ran an article with a title about how those on plant-based diets “may be ruining their workouts” because they’re not consuming the right types of protein. Sounds like propaganda straight from the beef and milk industry! The gibberish spewed by Shape is almost as ridiculous as that famous question vegans still get asked… Where do you get your protein? Compare the complete amino acid profiles of whey vs. pea vs. brown rice vs. hemp. 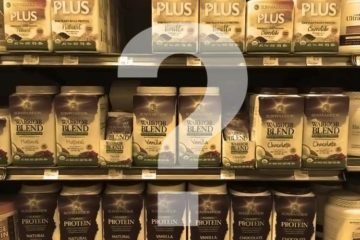 You will see the alleged best – pure whey protein – actually loses to a plant-based source. 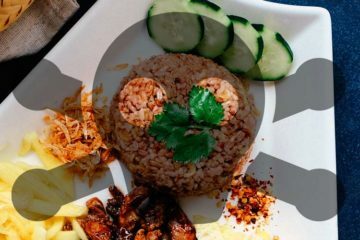 When it comes to the branched chains, brown rice protein has higher isoleucine (6.9% more) and valine (17.4% more). Whey does have more leucine, but it only beats by a hair (0.5%). As for me personally, I haven’t ate meat or eggs since I was 4 years old. I went full throttle and finally gave up my cheese addiction nearly a decade ago. Now keep in mind I’m not a bodybuilder and my arm exercises are intentionally designed to avoid adding more bulk (high reps using lower weights). Taking that goal into account, this is what I look like on a strict plant-based diet without using BCAA supplements. So yes, you can be a 6 foot, 30-something year old guy, and still pack a little muscle on a plant-based diet. However since that photo was taken earlier this year, I have started using BCAA powder. Why? Because often times for a post-workout lunch, I don’t want a hippo-sized meal. A light salad or snack is all I crave, but I know that’s not what my body needs after an hour long workout or intense surf session. Now when I don’t want to eat a full meal after a workout, I will do one scoop of Sunwarrior Classic brown rice protein and 1 scoop of the branched chains to augment what I eat. 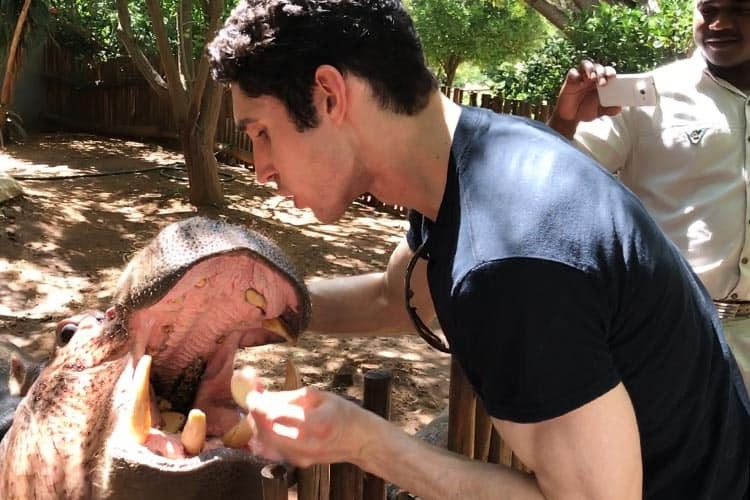 Plus, even when I do want a lunch fit for a hippo, I may not have the time to make it. Whatever your motive – time, efficiency, or wanting more muscle – there are plenty of good reasons to supplement with these three aminos. But as a vegan, your need for it is not much different than that of an omnivore. Don’t let Shape magazine tell you otherwise. 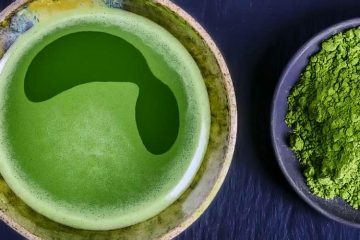 Even if you’re not plant-based, you may want to switch to a powder that is. For the non-fermented supplements, the primary source is keratin. That is the fibrous structural protein your hair follicles and fingernails are made out of. Since it’s the most concentrated natural source of leucine, isoleucine, and valine, it is what BCAA powder is made from. Solvents are used to extract them from the keratin. Where does the keratin come from? It’s not a myth. Given the secrecy around this topic, it’s impossible to say what the number one source is, but the evidence suggests that the majority of products use duck and other bird feathers, like chickens. Both the hairs and outer layers of skin on a pig are rich sources and they’re occasionally used for manufacturing powders. Even to an omnivore, none of these three sources sound particularly appetizing. If you enjoy eating human hair, then a psychological evaluation is recommended. All of the non-fermented (human or animal-derived) require extensive use of solvents and other chemicals to separate the amino acids from the dead tissue. 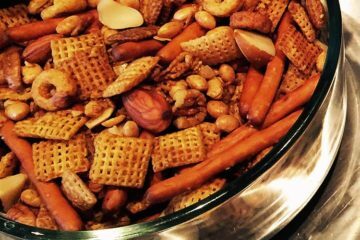 When it’s made using fermentation, bacteria and a plant-based ingredient – typically corn – is used to create concentrated sources of these 3 amino acids. Isoleucine and valine follow a comparable fermentation process. That filing doesn’t call the product raw BCCA powder, but keep in mind that 30° C is only 86° F… well below the 114-118° threshold which is considered the cutoff point for raw food. The brands Scivation Xtend, GNC Beyond Raw, XPI Raw, and Maximuscle Raw all market themselves as either being raw or having that word on their label. However most of these brands you do not want to be eating (we will get to the reviews in a moment). The Japanese company Ajinomoto is responsible for the pioneering the fermentation processes. They’ve been around since the 80’s and continue to churn out new and improved patents for the BCAA production processes. Cumulatively, Ajinomoto is listed as the inventors for some 130+ related patents throughout the world. A few of the earliest have expired, however they continue to almost have a monopoly on the technology. Every year or two, you will see new and improved methods being filed, with their most recent being in 2016 (2). Which are the best vegan BCAA capsules, tablets, and powder? Since Ajinomoto controls most of the intellectual property in this space, many of the highest quality brands will source their protein from Ajinomoto. 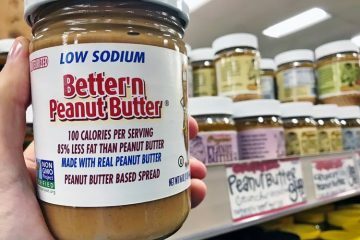 Some companies will disclose this source on their nutrition facts label. Others prefer to remain incognito and not promote Ajinomoto, because they also sell to consumers via Ajipure Fusi-BCAA. There are other sources of BCAA not made from human hair or duck feathers which truly are 100% plant-based. Those are made using older technologies; Ajinomoto’s expired patents. These are not bad supplements per se, but be aware that there’s a good chance they’re made in China. Not all, but many are. Most of the above products are powders for bodybuilders, but finding vegan BCAA capsules and tablets isn’t straightforward either. 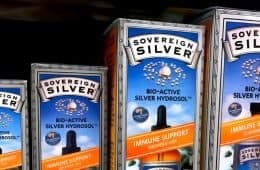 Solgar lists their capsules as vegetarian (gelatin free) but when it comes to the powder inside of them, their product label and website don’t specify the source. They might be vegan, but they might not since for some bizarre reason, human hair is considered vegetarian in this industry. Unflavored – Contains the ideal ratio of 2:1:1. That’s 2,000 mg of leucine, 1,000 mg of isoleucine, and 1,000 mg of valine per scoop. That’s 4 grams total of the branched chains. It has nothing else added which means it’s gluten free, soy free, and has no artificial flavors, colors, preservatives, or added sugars. Fruit Punch – This has the same optimal BCAA ratio of 2:1:1 and with the same number of grams. 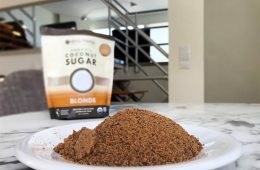 It does have added ingredients which are listed as citric acid, beet root powder for color, sea salt, stevia, and natural flavors which are not specified. As far as taste, our reviews of Clean Machine are as good as they can be. We say that because there’s no getting around the fact that these 3 particular amino acids will taste like crap when isolated and purified. That holds true whether you’re talking true vegetarian BCAA brands, or those made from human hair, feathers, and so forth. Skip the fruit punch and get the unflavored on Amazon. It’s sold in two flavors, red raspberry and watermelon. Watermelon tastes good (relatively speaking) if you’re okay with stevia. The raspberry tastes a bit like medicine, but not terrible. 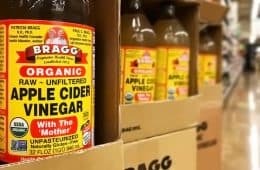 Aside from not knowing the country of origin, another concern is the vagueness for some of the things listed in the other ingredients: natural flavors, citric acid, malic acid, sodium citrate, stevia extract, beet root powder (color). Many reviewers favor the watermelon flavor. 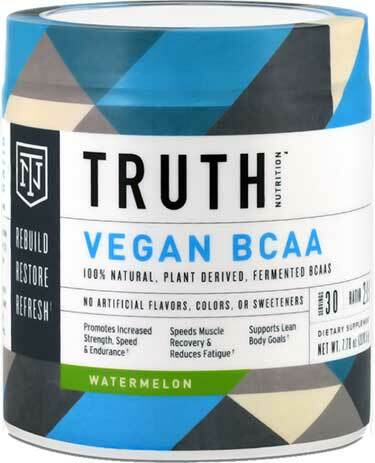 This supplement company isn’t exclusively plant-based, but they really do understand those who are and market their BCAA capsules to vegans. These are a great alternative to powders since no one buys a tub of those for taste, that’s for sure. On the front of the container they proudly list the source used and it’s Ajipure. So you can count on that coming from Japan, not China. What’s inside their capsules though is a little different and arguably, better for bodybuilding and muscle recovery. 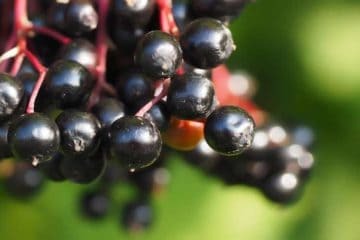 They add a 4th amino acid, beta-alanine, which they say boosts muscular endurance, reduces fatigue, and promotes your body to make more carnosine. The inclusion of the latter interests us the most, since L carnosine benefits glycation in the body. 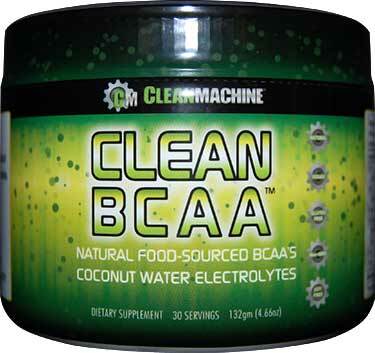 This formula results in 4 grams of BCAAs and 1 gram of beta-alanine per 5 capsule serving. 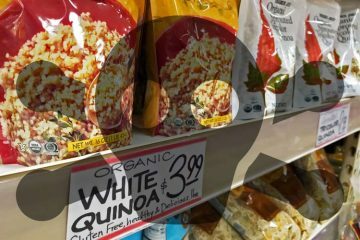 Some niche health food stores sell it, but the Whole Foods in Los Angeles do not. You can get it on Amazon. 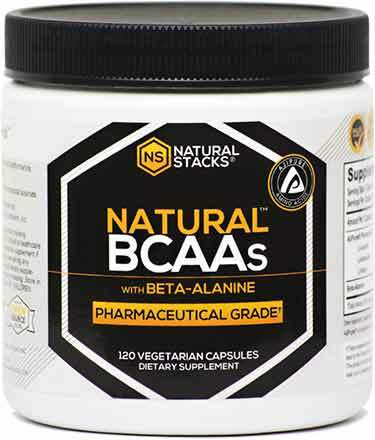 Like Natural Stacks, this company caters to all diets, but they still know how to make authentic BCAAs for the plant-based crowd. They use non-GMO sunflower lecithin. With no soy lecithin or inulin and being gluten free, it’s allergy friendly. 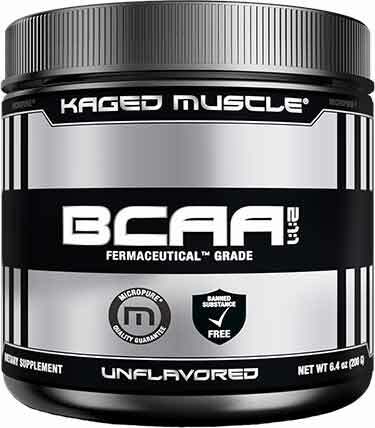 The contents of the powder are 98% pure BCAAs and when it comes to taste, Kaged offers an advantage that’s unique. 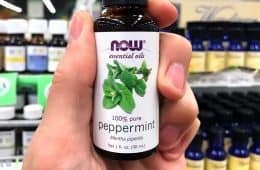 Rather than try to improve the naturally nasty taste of these aminos with stevia and flavoring, they take a different approach… microencapsulation. It doesn’t entirely get rid of the bitter taste, but it is reduced. We asked their source, but that was one question they didn’t answer in their email response. That doesn’t necessarily mean something sinister is going on though. It could have more to do with the fact that they’re the only ones selling it in this form, so they may want to keep it confidential. Even in cold water though, the microencapsulated BCAA still dissolves. The dosage per scoop is 5 grams total, in the same optimal ratio of 2:1:1. A good value is the 14.1 ounce (400 gram) size. Last but not least, we come to the review of the one that started it all. Ajinomoto sells Ajipure directly and has been doing so for decades. Something else continuing for decades is the stagnant packaging design. It looks the same as it did at the turn of this century. But you don’t buy supplements for what they look like, you buy them for what’s inside. The only drawback of this Japanese source is the price, which is why it’s definitely something you want to shop for online. 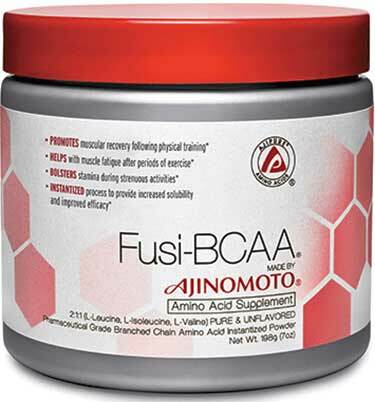 You can get different flavors of Ajipure Fusi-BCAA; lemon and fruit punch. Both are sweetened with stevia and they’re not soy free, because they contain soy lecithin. 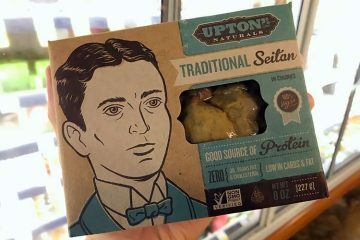 The unflavored also contains soy lecithin, but not any of the other stuff. It’s the better option. 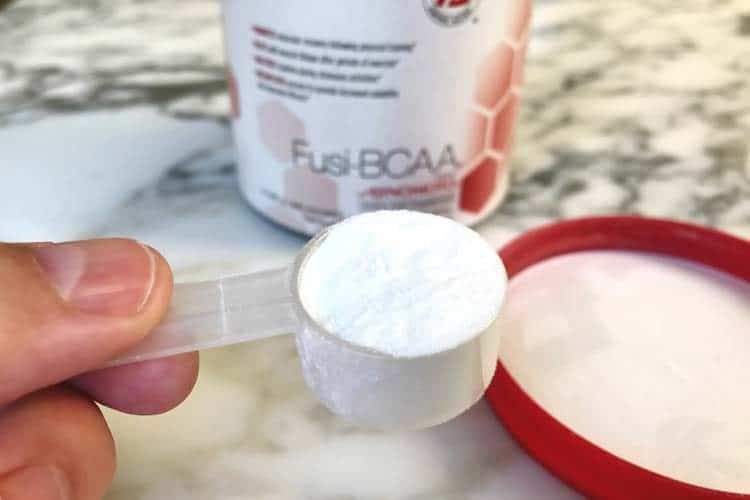 The best way how to take BCAA powder is as a shot. Dilute one scoop in 2 ounces of water or juice and down it. Adding it to protein shakes is not recommended, because the sour taste of the powder will ruin your otherwise delicious drink. That’s why you should use the BCAA first, followed by your normal shake or smoothie. As to when you should use it, one scoop immediately prior to or during your workout. During the first 30 minutes post, you can use another scoop. To be clear, you should not use it in place of your protein powder, but rather as a compliment to it. 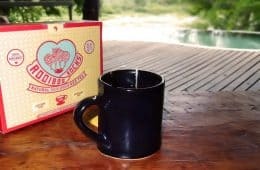 Where to buy Ajipure? Amazon, of course. I get this 340g size. On a related note, some have asked how often I go to the gym. I haven’t had a gym membership for over a decade. You don’t need fancy equipment at home to get a great upper body workout. Gyms are a big rip off too. At $60 per month, just 6 months’ worth of a gym membership is enough to pay for all the at-home equipment I use for my upper body. It’s a cheap investment and huge time saver. Plus, the concept of using shared equipment that hundreds of sweaty butts and backs have been on is disgusting. My neighbor’s wife got a terrible staph infection from an expensive gym up the street. No thanks. For abs, I hoist my lower body up and down using a multi-grip pull up bar. For arms, I use PowerBlock Elite dumbbells. Since the pair is adjustable, they can work whether your goal is to tone up, get ripped, or go for big bulk. Half the time I’m lifting them, I’ll be laying on my back using an exercise ball as a cushion. Use the bar and the dumbbells for about 1 hour cumulatively, with 3 sessions per week. I wrote to Bulk Supplements inquiring whether or not their BCAAs were vegan-friendly. I am shopping for a BCAA supplement and have questions about yours. I understand that the source of your BCAA Powder and Capsules is Non-GMO Corn and that your Capsules are vegetarian-friendly. I have read on Superfoodly that BulkSupplement’s BCAA Supplements are not safe for vegans or vegetarians. Can you please confirm or refute this? Thank you for the clarification. As mentioned above, strangely it’s allowed for those made from human hair to be marketed as vegan/vegetarian friendly. Being that BulkSupplements provides no details as to the source in their product page (other than saying it contains corn) be skeptical. Also the page does not have the word vegan or similar, so asking her exactly how it is made and where she is getting that info would be a good idea. As is often the case, sometimes you as the customer may know more than the CSR rep you’re dealing with. Very helpful article, thank you! I didn’t realize human hair could be label veg-friendly. 🙁 So disgusting. How do you feel about Women’s Best Vegan BCAAs? 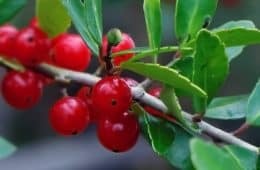 Can’t comment on ingredient sourcing since that is not specified, however the flavors we see on the Women’s Best website all list artificial sweeteners (sucralose, acesulfam-K). For that reason, it’s not one any of us would use. I am transitioning to cleaner eating, not saying I am going to be 100 % vegan. I do want to enjoy a steak every so often so I want to minimize my “bad” good food intake. So i am looking for cleaner / vegan options when it comes to my workout supps..
Have you used and tested all these brands? Since you say that you get the 340g size of the Ajipure is this the brand that you use? What do you think about Vega Sport Protein Powder (Plant Based amino acid protein powder)? Isn’t this Brendan Brazier’s company which should be plant based trust worthy in all aspects right?